In the absence of a higher power I thought I would bring you tonight's report. The higher power currently being on Darley Park listening to the Ukelele Orchestra of Great Britain. Meanwhile back at the railway, the passenger service bobbled up and down happily all day. Only once finding itself slightly surprised by a fallen tree at Hazelwood, they took all in their stride though. Around the station the passenger department could be found moving trolleys, painting fences, containers and themselves. 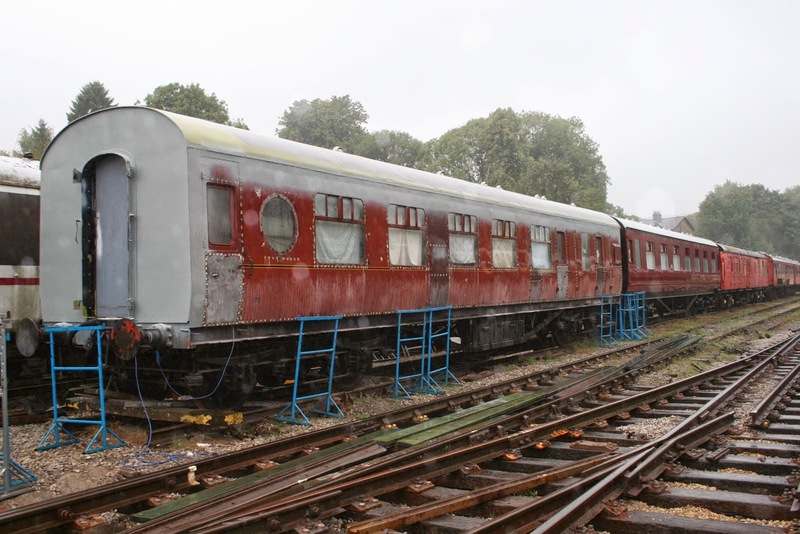 In the yard the painting theme continued as the DMU support coach received more undercoat. Further welding and grinding work took place on this vehicle to keep the weather out. 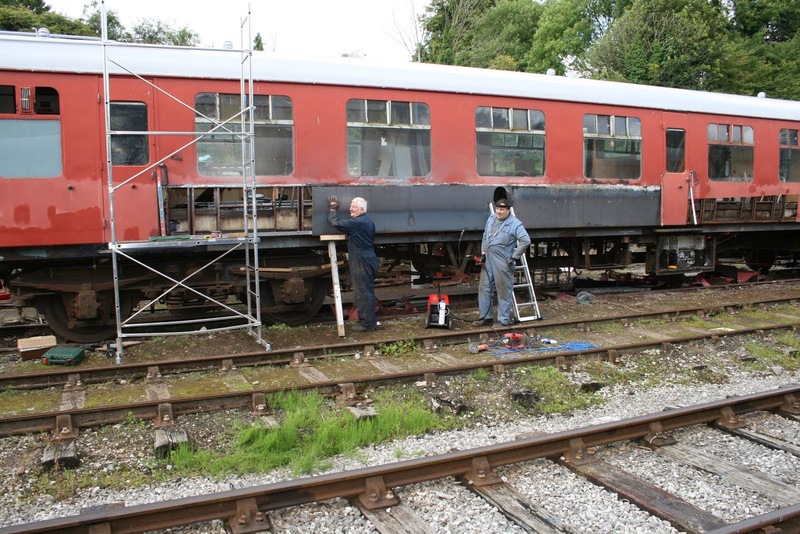 On the opposite side of the yard alone (I think) T.Dale continued the herculean task of restoring the MK1 fleet. The Booking Hall and EVRA shop shook the wallets of our visitors and the Buffet entertained further afternoon tea guests. I think that's about all apologies if I have missed anyone out. A quietly productive day. PS Normal reporting will resume next week. Hi Guys - Yes its a little late,so shoot me.On arrival home it was straight out for meal and back to Watch Big Brother.So I forgot you.!! Anyway Sats weather stayed Dry and the Class 33 worked all four Duffields faultlessly.Probably its last run for a while has its due to visit a few Diesel Galas over the Winter.Passenger numbers were disappointing but we have Just had a Bank Holiday and spent all our money !! Having spent most of the day at meetings Im not quite sure what progress was made in other departments but the DMU Team continued work on refurbishing their support coach,continued. Exam on 51505 and resurrected the generator taken out of Iris abot 11 years ago,which started first time. Thanks to you all. A day in which we could hardly top up our tans, but nevertheless we entertained three steam driver experience guests, some random visitors and a wad of delivery people. fence. 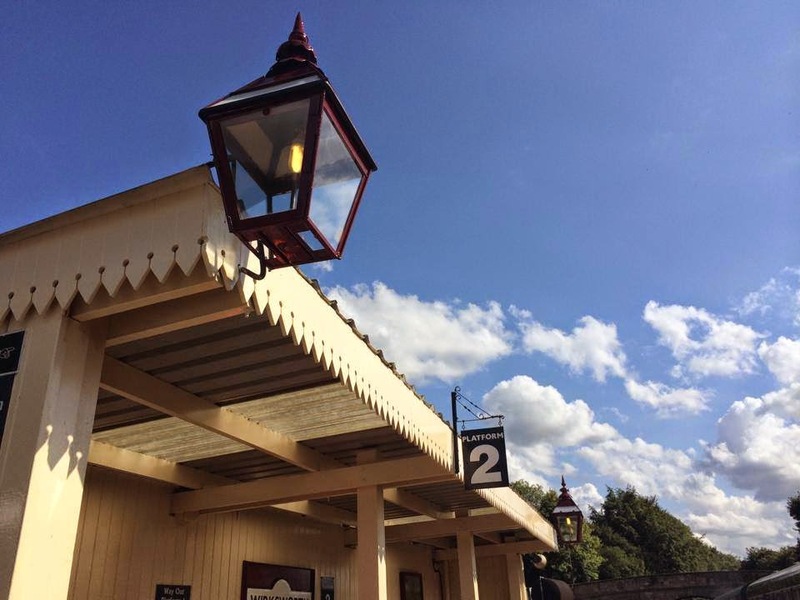 The Station Foreman completed the painting of the platform lamps before touching up the gents and fitting in a short trip to Ravenstor to paint the sign. Outside the station the usual suspects were found filling potholes, of which were are down to the last 500. Another day of action with a well supported service and the EVRA shop adding a further dimension for our passengers.. The PWT can congratulate themselves on a most productive week with the two through roads over the new Wirksworth crossover screwed down together with the lever boxes associated with the installation. Ballast was fettled around all this new work. A photo taken from yesterday by Derek Mason may indicate that I sometimes, but not often, leave the Office! The dmu team spent the day preparing stock for tomorrow's steam experience and Saturday's loco hauled stock. This stock is unusually seen stabled at Platform 3 so that the toilets could be topped up with water. The team also dealt with a defective water pipe on 51505 and made progress with the roof refurbishment of their support coach. Derek's end is now complete- this being the south end of the Stanier BTO and Network Rail contractors descended on the Car Park to prepare for the installation of gabions along the retaining wall. We await developments as this project has been gently wandering on over many months. EVRA concentrated on the Children's Play Area and have made great strides to make it again a usable area. The Booking Halls tended to our customers and the Pullman Buffet Car pleased some 30 participants for the Station Master's VIP lunch together with an afternoon tea for birthday celebrations. There was further cogitation at Wirksworth of marketing initiatives that may help the end of season footfall. Another short clip of history for those of you who are lovers of motive power depots. The day brightened up and became quite warm as afternoon emerged which seemed to influence a well supported service that also saw the EVRA shop opened. There was much endeavour by the PWT as the fortnightly track patrol was completed but much effort put into the new Wirksworth crossover. Two 20ft timbers were inserted to the south end of the crossover to accommodate the lever frame and road 1 had most of its chairs screwed down. 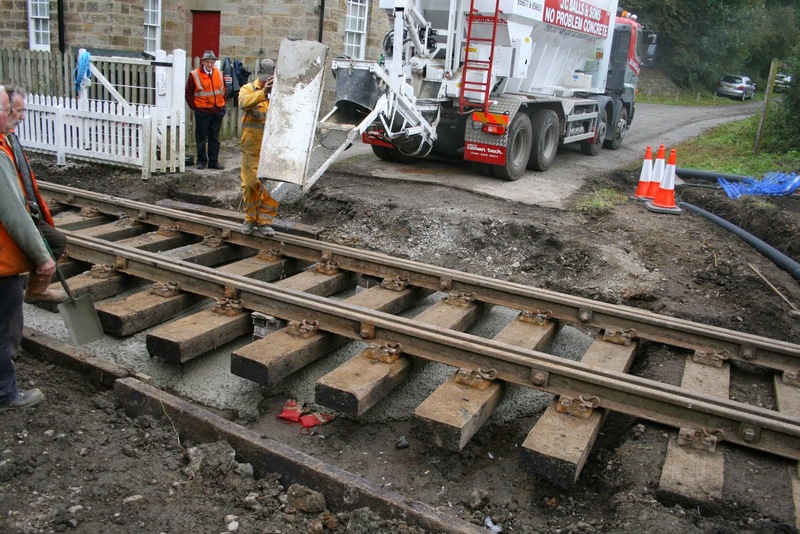 To insert the timbers involved removing two rails on Road 2 and reinserting them at the end of the exercise. Quite and achievement by the team. The photos show the Mark 1 SO having new steel work inserted and the remarkable achievement by Ben Field to put some authentic lining on the dmu support coach. The LCC moved into Santa mode by finding amongst her treasures most of what is needed for the lucky dips planned for the new weekday Santa trains planned for this year. The dmu team changed a defective water pump on 51505 to good effect. The Booking Halls at Duffield and Wirksworth had a productive day but the spend in the Pullman Buffet Car was somewhat dismal. Our hearts were gladdened by a party using the 1615 Wirksworth to Duffield to commence their journey to London and the boarding of the 1515 Duffield to Wirksworth service at Idridgehay by a couple, a German and Dutch national, who had based their walking holiday in Wirksworth because of our train service that allowed for walking and train rides. Again we must be doing something right! Tonight sees the Extraordinary General Meeting of the Company to deal with those kind souls who leave their shareholding to the enterprise upon departure to the great Railway in the sky. The usual busy Tuesday which started off quite damp and miserable but ended up not too bad. The passenger service pottered up and down happily with support from the Booking Office's and the EVRA shop. The Buffet served a large amount of Afternoon Tea's to many happy customers as well as tending to the thirsts of other passengers. Having received voucher expiry e-mails, the phone began ringing once again with people trying to redeem their Amazon vouchers. Fred and Iris were in action again giving the Mess Room a going over and also tending to one or two saggy plants on the platform (it all makes a difference!). The LMSCA were out in force and great progress is being made on both of their coaches. The Third Open is nearly paneled inside already! The DST were also out in force steaming No.3 for a test which seemed to be quite successful. Track patrols were the order of the day for the P Way team and Rodney removed lots of ash that had accumulated at Duffield. The DMU team had an unusual sort of day which started off with a clean of the three car from the weekend. The First Class was hoovered out and the rest of the floor mopped. They then progressed to rectify a vacuum leak on the 'bubble' which had randomly developed (turned out to be the seal on the Auto Feed Valve), before moving on to further progress on the support coach. More trains tomorrow and Thursday and the weather outlook is better. Just a reminder as well that our popular Tunes and Chips event is coming up on the 6th. This year we have a different band in the form of Acorn Roots who play 60s and 70s music. I would recommend booking if you fancy this and tickets can be purchased in advance online at www.e-v-r.com/shop or pop in to the Booking Office at Wirksworth. 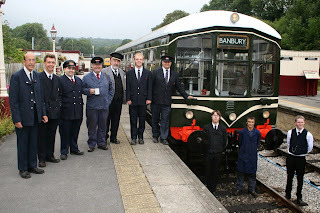 It's quite difficult to be upbeat about today, a Bank Holiday!, with its incessant fine rain that dampened most spirits but the team soldiered on with a dmu Duffield service and Henry Ellison on the Incline. Very special thanks go to Richard who had the most miserable day as third man. The EVRA shop supported our endeavours as did the Pullman Buffet Car and the Booking Halls at Wirksworth and Duffield. The VCT team of two achieved a little work after sheltering under Hazelwood bridge realising the rain would be unremitting. 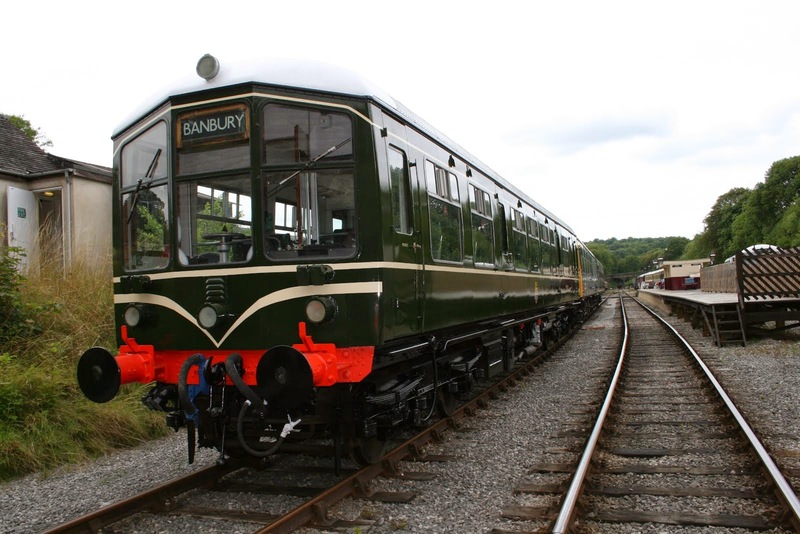 The dmu team were out in force conducting a FP exam on the "Bubble Car" and vastly improving the appearance of their support coach within the comfort of the Maintenance Facility with a glimpse of their work shown. The LMSCA attended by retired hurt that they could do no more today but the results of the improvements to the exterior of the BTO are beginning to be seen. Our good wishes go to Julie Ball who sustained a fall in the shower on the last day of her holiday and may have broken a few bones. We hope she has a swift recovery. PS - a very short video for you for anyone who remembers Henry - please don't blink while it is on! Apologies for the slight delay in getting you your daily fix of excitement from our internationally famous railway, this was due to a kink in my computer. Anyway we had a lovely sunny day in which our many passengers and visitors were able to enjoy our fine line and its many scenic cows. 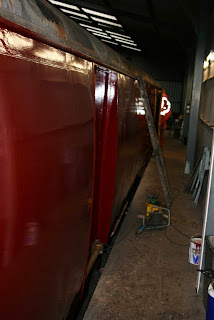 Down the yard, the Austerity Team continued their long-running restoration programme with further scraping and painting. 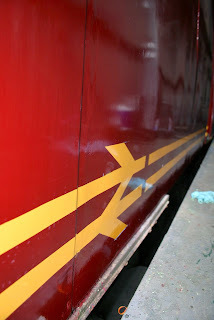 Paint also found its way on to the DMU team support coach, together with some welding and stores filing. The much sought-after BR tartan paint has been rediscovered and put on ebay ready for the Scots to repaint their post boxes with. JCB Purves managed to get some paint onto the platform 2 fence, as well as some other places, and the DMU team dealt with a duff door on 55006. Typical British bank holiday weather early on this morning failed to dampen the spirits of our visitors and both our Duffield and Ravenstor services enjoyed very good passenger numbers throughout the day. The 10:15 Wirksworth to Duffield service carried passengers en-route from Wirksworth to Edinburgh via Derby and the train was requested to stop at Shottle by a group of passengers also on their way to Derby. Down the yard the DMU group were gainfully occupied whilst Tim Oakes and others were busy working on the Duke's axle boxes and frames. The LMSCA split into two teams focussing on the panels of the BTO and the interior of the Third Open. Both the Pullman Buffet and Booking Hall was kept busy by a steady stream of customers throughout the day and down at Duffield and a group of happy travellers held a birthday picnic in the sun. guests for the Railcar Driver Experience. 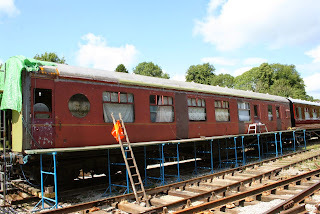 involving work on the exterior panelling, much the same being true of the EVRA carriages. cleaning, polishing and bin emptying took place, and the Duffield staff engaged themselves in some flowery moments. Today Joe and Jake celebrated the collection of their excellent GCSE results and are pictured looking suitably smug. Our young volunteers have done extremely well in 2014 with the infiltration of RVEL, Nemesis Rail and Bombardier. All have benefited from the advice and guidance provided by the more senior members of our team and all should be congratulated for crossing the age divide that ensures we have a viable future. Today's service worked well supported by the EVRA shop and all entertained a number of pleasant customers and today's driver's apprentice. There was a test lift of Cathryn's boiler that proved successful so the lump has now departed for Israel Newton's works for eventual renovation. This left behind the firebox which will require removal by the Komatsu when it returns from Shottle. This is all part of the plot to provide space for a new line alongside the Maintenance Facility which will eventually be covered as funds permit. There was a joint effort to try and resolve L J Breeze's reluctance to change direction. All the team retired hurt as the machine would not misbehave to reveal the source of this problem. 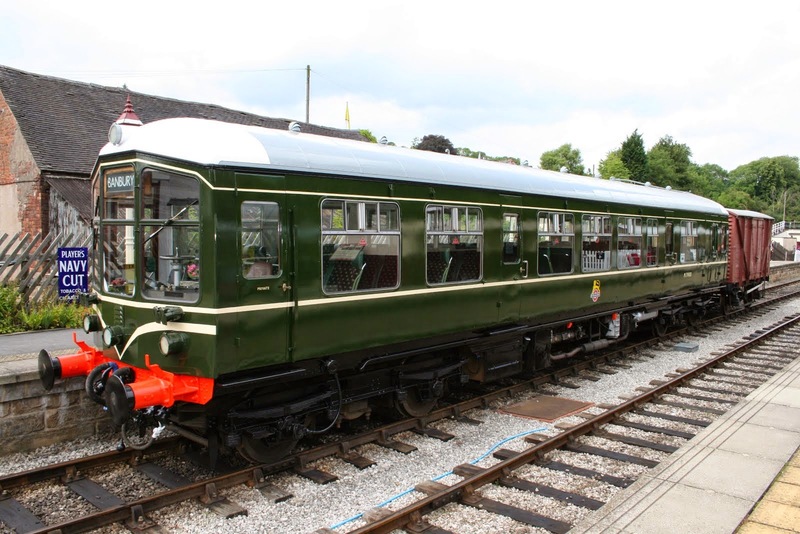 New handrails were fitted to the EVRA shop and the dmu team fitted a new compressor to 50170, fuelled vehicles for the weekend and shunted all necessary vehicles including preparing the steam loco's trailer car. The PWT had a relaxing day as they serviced the Ground Frames at Duffield and adjusted the facing point locks at Wash Green. 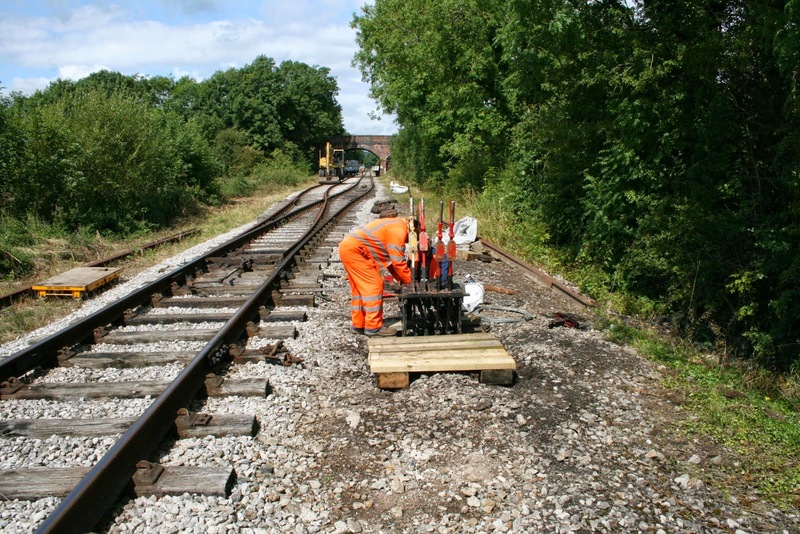 A specialist track chair was recovered from Duffield to be installed on the relocated crossover at Wirksworth. PS - today's photo was supplied by Leigh and shows Joe and Jake basking in their achievements after dashing into school prior to attending to their Railway duties. A splendid day where we welcomed a goodly number of passengers to our services which were supported by the train crew and EVRA shop. Today's photo shows the steam crane in action some time ago as the machine is evaluated for departure from our enterprise. A delightful piece of equipment that needs a good home as its continued operation with us is just not viable. It is a classic case of something that should be demonstrated to a wider world but is beyond us at the present time. 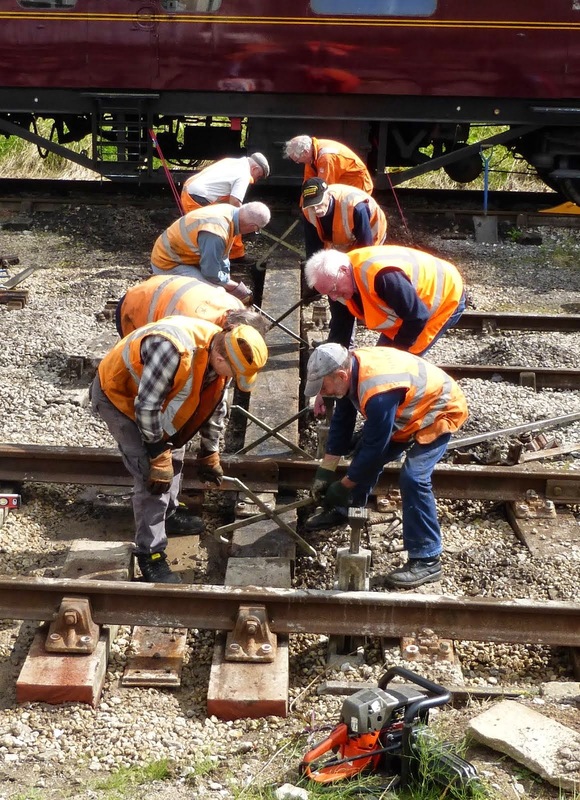 The PWT continued with work on the crossover with further chairs screwed down and also accomplished the servicing of the ground frames at Wirksworth. 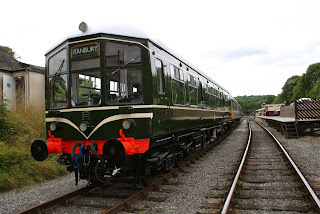 The dmu team created new combinations, readied one vehicle for the weekend's steam operations and positioned the 3 Car set for the ministrations of the LCC. The LCC included the Training Room in her attack on the Railway's inner cleanliness. 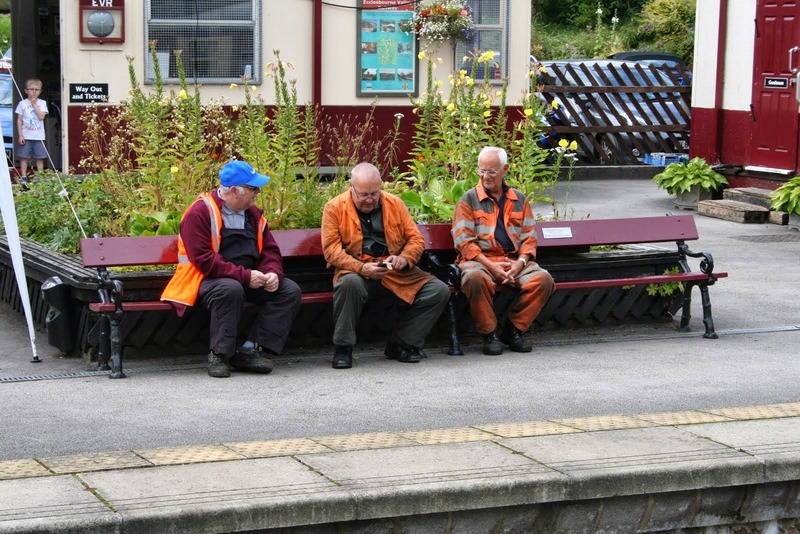 Richard Preedy conducted his crusade on the weeds that invade our track at Gorsey Bank, around the Wash Green crossover and the Ravenstor station area down to the Cromford Road bridge. All done by backpack and spray which will lead to a full dose of embrocation tonight. The LMSCA continued with their rush to complete the BTO and TO with further steel work on the south end of the BTO, the gangway connection and boarding out the Third Open. The Pullman Buffet Car and the Booking Halls had a most satisfactory day tending to many happy customers. PS I tended to a visitor that turned out to be the owner of the house shown in the background of the "Escape to Wirksworth" poster shown at some East Midlands Trains stations including the Booking Hall at St Pancras. She bought two copies of the poster to present to her sons and rejoices under the name Jean Crapper. You couldn't make it up. A pleasantly sunny, if chilly, day with many happy customers including the passenger of the day! This passenger alighted at Shottle and waited there for the return service from Duffield. He then declared that he had set foot on every station between Wirksworth and Brussels Midi! The service warranted the two car set provided and carried good loads throughout the day. 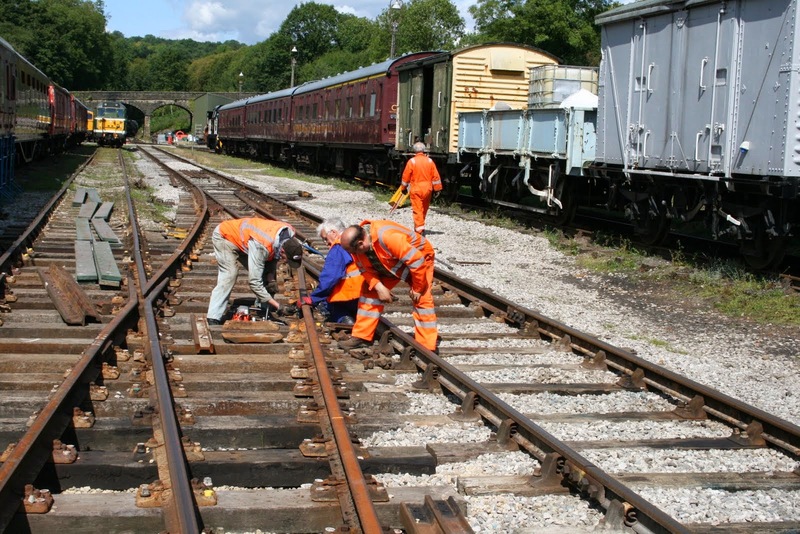 The PWT undertook emergency repairs to a hand point at the north end of Wirksworth Yard and then concentrated their efforts on the new crossover to good effect with quite a small team. A photo shows them in action. Hylton had an half day diversion as he tried to control the brambles that have invaded the walking route to Duffield North Junction. My thanks go again to Doug Futter that sourced new fan belts for L J Breeze and fitted them at, what seemed to me, to be record time. Again it is the knowledge that confidently knew where to go for the belts and apply them that brings joy to a non technical person that I am. The DST were cleaning Henry Ellison for the weekend and refitting parts to Cathryn. 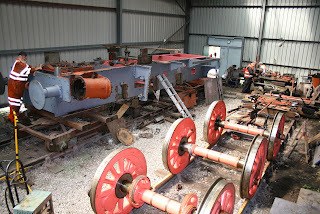 The area this loco occupies has changed out of all recognition as parts are cleaned and painted, some of the stalwarts are illustrated in the second photo. Special mention for Joe Marsden who has been the lone dmu fitter today and fitted a second fuel pump to 51505 after the first attempt proved to be a dud. The vehicle is now operational again and 50170 has a change of compressor as these vehicles now have to really work for a living. The LMSCA have moved further forward with the southern gangway connection on their BTO and tended to the vehicle's gutters together with further boarding out of the interior of the TO. The Pullman Buffet Car entertained today's passengers along with a delighted complement of afternoon tea customers most of whom left with a "doggie bag". The Booking Halls at Wirksworth and Duffield had a financially successful day finding time to construct the first Santa leaflet draft at Wirksworth - Christmas is coming! A blustery day but it was sunny. We welcomed a test customer for a satisfactory 1530 test as they were ably assisted by MKT. MKT also carried out an inspection of pointwork in the yard inbetween dealing with the customer. The Booking Office continued to deal with Amazon enquiries as well as other general admin, including tickets for the increasingly busy Tunes and Chips evening. Plumbing was very much a theme today with the defective Mess Room tea boiler being swapped out for another alternative and a defective on/off valve on the water heater being dismantled and put back together. There's no knowing why this fixes a fault, it just does. Attention was turned to a leak on the water heater in the Ladies, only to find that the all important plastic flux gromet which sits inside the pipe had mysteriously disappeared without a trace which has ultimately caused the leak. I don't think these components are collectors items so it is a mystery. Fred and Iris also popped in to give the Mess Room a clean. 'Bout it really. Very pleasant. Today we had a rather busy day filled with many Amazon voucher holders, as well as routine passengers. The DMU group spent most of their time assembling a selection of seat frames and fixing electrical faults. 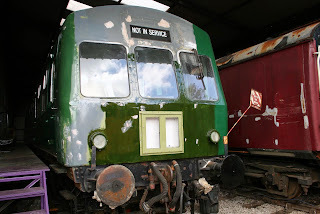 Fields of Brassington spent some time fixing 51505's air and axle panel lights. Meanwhile the LMSCA continued working on the BTO, JCB Purves did some station strimming, mowed the wideway and assisted with painting the station lamps. Whilst all this was going on Hodgkinson Lighting Services reported that the Class 31's north-end headlight wiring has been investigated. Today's main excitement appeared to involve the service train encountering the entire valley's supply of sheep at Hazelwood. We are still looking for the mint sauce. make a successful day in passenger numbers. The DMU Group had a busy Day holding a Mutual Drivers improvement Class in classroom and outside with practical instruction.They also hosted a visitor from a Railway near Rushden in Northants who is restoring Bubble 55029 who received instruction on the workings of a DMU and Driving Instruction.A lone fitter worked on 51505 removing a new fuel pump which didn't work.Work also started on DMU Stores vehicle roof.The Duke saw work continuing moving this project forward.Thanks to both Booking Offices and Catering for good results. Mike Evans. Fwd: [wirksworths_railway] Saturday 16th September 2014. Subject: [wirksworths_railway] Saturday 16th September 2014. Booking Hall, Field Publishing had written an entire DMU manual and exterminated a strawberry trifle. 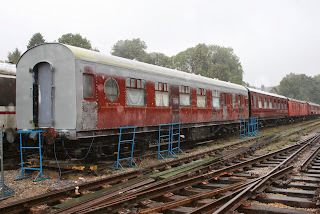 The dmu team successfully replaced the fuel pump on 51505 and can be seen in the bowels of Wirksworth and a further photo of our new arrival beginning to take shape. The team also fuelled our Duffield set at midday and shunted various items that will allow tomorrow's diesel and steam experiences to commence without impediment. The lawn has been mown at Duffield. The Booking Halls at Wirksworth and Duffield enjoyed good custom and the Pullman Buffet Car entertained today's Station Master's VIP Luncheon clients along with today's passengers and casual visitors. At Wirksworth it was a damp, dull and miserable day but at Duffield it was sunny and warm! A lone track patroller completed the whole line with the Gorsey Bank to Ravenstor section. Today's service was a concert of single units with the Bubble Car catering for the main line service and Iris operated the Incline. The operations were supported by the EVRA shop and model railway. Head of Gardening was active in tending to the garden opposite the Booking Hall and along Platform 1. The PWT progressed painting of the Shottle South Ground Frame and moved much surplus ironwork from the site of Shottle North's Ground Frame. Wagons were loaded with materials required for further progress at Wirksworth. 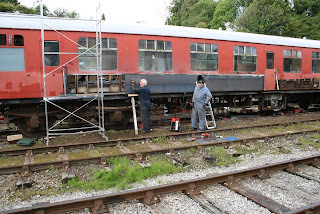 The LMSCA commenced tidying up the paintwork on the east side of the BTO with the application of undercoat as they respond to an appeal to raise the presentation of the coach to our visitors. The dmu team concentrated on replacing a fuel pump on 51505 and fitter Futter reported that he had sourced replacement fan belts for L J Breeze. 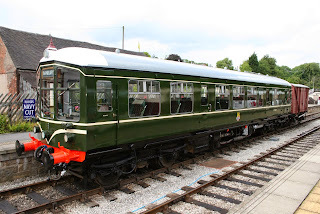 The Pullman Buffet Car together with the Booking Halls at Wirksworth and Duffield had a remarkably successful day. Two photos for today, the first of which demonstrates that nobody should have any fear of passing over Idridgehay's level crossing given the amount of ready mix that supports it. 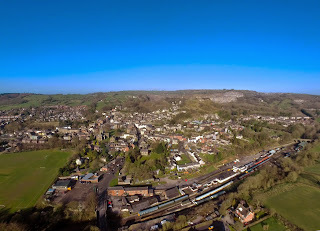 The second is from the Company drone overflying Wirksworth Station. This equipment is sponsored by the CIA. The LMSCA continue to stride forward with both their TO and BTO. The two photos show the interior of the TO as it displays the roof insulation and panelling installed and the gutter modifications on the BTO designed to eradicate water ingress which was a failure of Stanier's original design. I know I should wash my mouth out now but he didn't get everything quite right! The service today enjoyed satisfactory custom and was supported by the EVRA shop and the Booking Halls at Wirksworth and Duffield. Fred & Iris made their welcome Tuesday visit that prevents the Mess Hall from getting out of hand and David gave the Three Phase box at the head of the station approach a further treatment of undercoat. There was much shuffling of dmus and the fitted van that featured to good effect on Friday's photo charter so that everything gained their right place. The photo charter props were also returned to their original position awaiting another starring role in the future. The DST concentrated on miscellaneous repairs to No3 after last week's boiler inspection and Doug Futter returned to L J Breeze that needs a set of new fan belts.He removed one for sizing by a specialist fan belt supplier. The PWT decamped again to Shottle with a general tidy up there, construction of a platform for the south ground frame and the beginnings of an ash based walking route from Shottle station to the frame. Track patrols of the whole line were also undertaken. The Pullman Buffet Car enjoyed another day of very satisfied Afternoon Tea customers together with our passengers and "off the street" customers. The Passenger Department had a lengthy and constructive meeting that is an essential part of our forward planning - Christmas is just around the corner! Yesterday's unreported endeavours included a welcome whole line weed treatment run, the VCT working on fencing issues south of Hazelwood and flailing north of Shottle and my thanks go out to all involved. PS We wish Derek Glynn of the LMSCA, after more knee surgery, a speedy return to active service as the work rate has declined during his absence! Enthusiasts.The sun came out later which produced a trickle of passengers to keep us in profit.All Units performed well and I thank Booking Office Staff,traincrews and catering for making it a interesting and successful Three days. Carriage people were exacly doing but Im sure it moves us all forward. A very distinquished train crew assembled in period uniform to commence today's dmu photo charter day reflecting great credit on their willingness to go that extra mile. A tremendous amount of effort and planning has gone into the three day Multiple Memories weekend to create scenes that are not possible on any other heritage railway. A short video sees Iris depart hauling its cargo of milk churns and mailbags and I look forward to seeing the results of the photographers work. Many of you will have received the latest edition of the Ecclesbourne Express which, as usual contains a contribution from me. For the first time ever this has been edited to a degree that renders it nonsense! I had hoped to give you a thought provoking piece that may have lead to some positive rethinking of EVRA's priorities but it was not to be. However, for anybody that is interested in my opinion I attach the article in its original iteration. Needless to say, I will be making no further contributions to this journal! Today's service produced successful results and my thanks go to the train crew, the EVRA Shop and the Model Railway for delivering all that was required to delight our customers. The dmu team continued their great cleaning project that even included three milk churns that were pressure washed for their role in cameos for tomorrow's photo charters. All the rolling stock is now in position and last minute running repairs to 55006 will ensure the first day of the Multiple Memories Weekend will get off to a flying start. The PWT had a good tidy up day at Shottle for the grand opening on Saturday with all stock placed in the sidings and a clear run loop road. Further progress was also made with the footpath connecting the platform to the new entrance and exit steps. David N has largely completed the new structure that protects our 3 phase electrical supply from interference as it enters our site at Wirksworth. My thanks go out to him for resolving a problem that might have come to bite us. The Pullman Buffet Car responded magnificently to a sudden illness of chef Martin and delivered to our VIP Luncheon customers and today's Driver's Apprentice guests. The Booking Halls at Wirksworth and Duffield had a satisfactory day and at Wirksworth there were preliminary discussions that will lead to the launch of this year's Santa products. This, as I am sure you realise, all seems most unreal on a bright sunny, warm day. Today's photo is of Iris with her fitted van that will form part of tomorrow's tableau - should be a great day. Bob Gibbens has been touting for business at Foxfield! It's always better if an attachment is attached. A day of very mixed weather that didn't seem to inhibit a splendid number of passengers after yesterday's rather disappointing numbers. The service worked well with the Bubble Car on our Duffield trains and a two car set on the Ravenstor service. The train crew were supported by the EVRA shop and there was much continued preparation for the coming Multiple Memories weekend with frenetic washing, fuelling and attention by the LCC to the interiors. 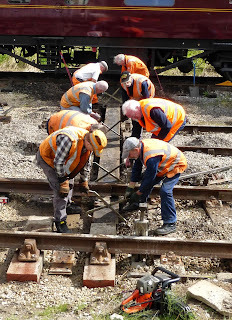 The PWT were out in force at Shottle with today's photo illustrating the Shottle South Junction Ground Frame that now locks the points in the correct direction of travel with much energy being put into the signal wiring run that will allow the Shottle UP Starter to be activated from the frame. The PWT also worked at the finishing touches to the platform project that links the platform to the new entrance/exit steps. Miss Bell seems to have been captivated by all the activity with her man tidying up her fencing so that it is sparkling for Saturday's opening. It was good to welcome David Foale from the Bluebell Railway who acted as their Finance Director for 33 years before handing the post on this year. On the mundane side of our enterprise a scrap skip has been installed at Wirksworth that hopefully will produce better results than the previous contractor. Every non ferrous item deposited in this new facility diminishes the result so please don't use the new skip as a repository for your domestic cast offs, unless they are metal! The Booking Halls at Wirksworth and Duffield had a most satisfactory day with the Pullman Buffet Car weighing in a respectable performance. It is somewhat of a mystery that passenger numbers have fallen in late July and early August that may be ascribed to the first flush of school holidays taking people away from our shores. However, the tills still overtook our modest cost passenger services. The weather was unpleasant during the afternoon with heavy rain recreating a typical British summer day but our services were supported by the EVRA shop, that enjoyed the substantial purchases of a child from Hong Kong, and the Model Railway Exhibition. Yesterday's teams achieved a substantial amount of flailing and fence repairs which form an essential part of maintaining our line. 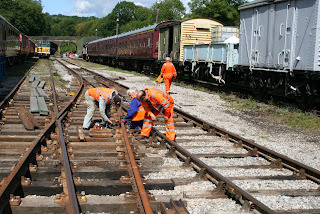 The PWT concentrated their efforts on Wirksworth and greased all the hand points within the Yard but were frustrated by the weather in their quest to service the ground frames. Much progress was made with the ground frame to be installed at Shottle North Junction and the refurbishment of the many signalling parts required there. The Pullman Buffet Car looked after our afternoon tea customers where the lower temperatures made the experience more pleasant. 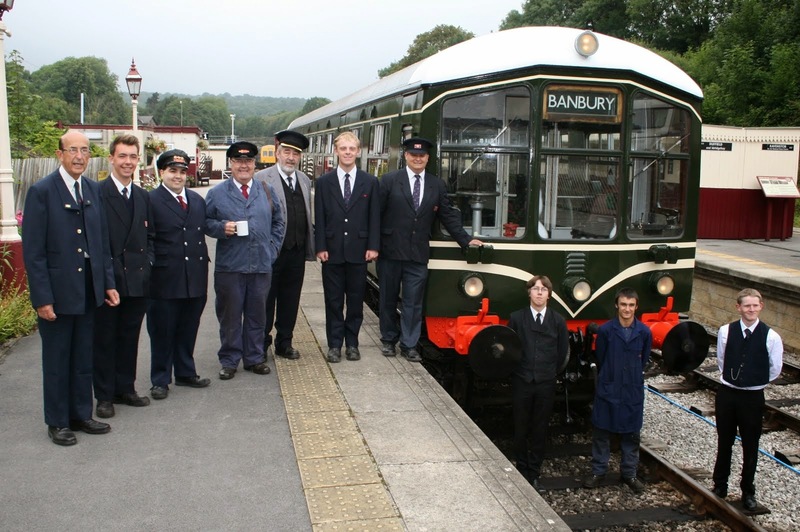 The dmu team washed a further three vehicles and tended to an ailing fan belt on 51188 as they move ever closer to the Multiple Memories weekend. The DST were quietly pleased with themselves as the boiler inspector was content with the cold examination of No3 and continued with the long process of restoring Cathryn to life. The LMSCA made further strides with their BTO and TO as these vehicles work towards entering service in 2015. Today's photo shows the pride of the fleet basking at Platform 1 which continues to provoke gasps of amazement of what can be achieved within our very limited maintenance facility. 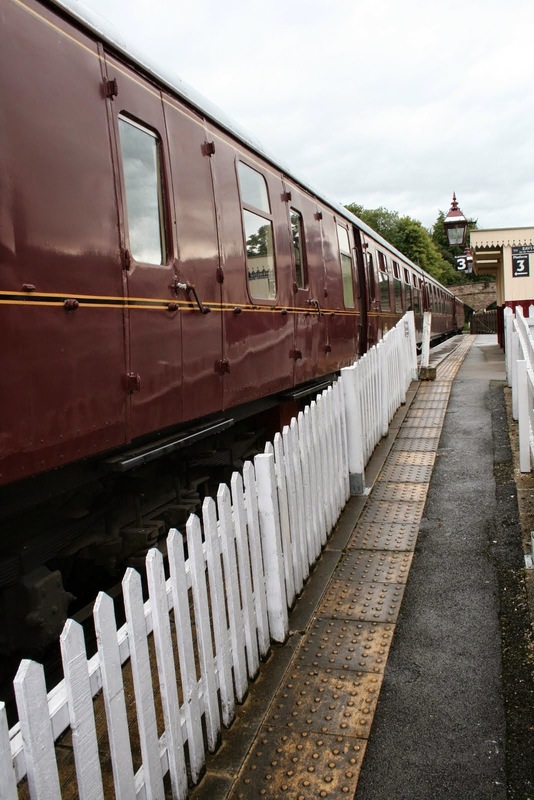 The Booking Halls at Wirksworth and Duffield provided good service to our passengers with Wirksworth finally bottoming a glitch that had bedevilled accurate numbers for the Pullman's afternoon teas and lunches. In memory of Dennis Trowell. My father recently died after a struggle with prostrate cancer. Before he was ill he visited us in Wirksworth regularly and loved following the progress of the railway. I remember on a whim, Dad and I splashing out (twenty five quid I think it was), on a ticket for the first trip to Idridgehay and having a sneaky glass of wine on the platform. We thought it was brilliant and a snip, Mum couldn't believe we'd spent fifty pounds to go three miles at an average of about twenty mph! Sadly Dad was not able to make the first train to Duffield, so I made the sacrifice on his behalf and sent him a slightly shaky video as I had to stand on the way back because the train was so full and I gallantly gave up my seat to someone more infirm than me. Mum, Dad, my Sister and her family, all live in Hertfordshire, so Dad had to follow progress on his computer, and maintained his interest, albeit from a distance. He told my mum that he would like his ashes spread next to the track at the nearest spot to our house in Wash Green, which with the help and support of Martin I have now done. So, many thanks to the railway in lots of ways. Shall we start with a really bad joke? Today too many Cooke's didn't spoil the broth… Cooke Jnr and Cooke Snr completed the repaint of the shelter on Platform 2/3 including the hanging platform numbers and cleaning out the lenses for the lamps. Meanwhile Mrs Cooke cleaned a grand total of 4 vehicles ready for the coming days. 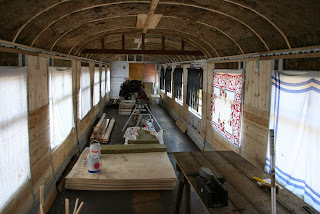 This included a grand clean down of the interior or Iris following the stint in the shed. Fred and Iris made a surprise Monday appearance and fumigated the mess room. The VCT assisted with a request from a neighbour as well as put up some more fencing in the vicinity of Hazelwood. The Booking Office had a good day with much product development and planning for this coming weekend, which sees our first ever DMU Photo Charter, pre-bookable online. A very pleasant day along the valley, sunny and bright with a gentle breeze to keep the heat off. We pottered up and down with our passengers, a Driver's Apprentice and our lunch guests. painting, and the SO received some welding. for the admiration of all concerned. Brassington Field was engaged in fault finding on unit 55006, and on the construction of a replacement set of steps for access to the DMU support coach, whose previous steps had strangely succumbed to Costa Rican Flying Woodworm this morning. Back at the station, Cooke Enterprises, having fed the goat, completed the undercoating of the final section of the platform shelter, and only a short moment remains before this exemplary project is brought to a successful conclusion. Also on the painting front, JCB Purves addressed the front of the Booking Hall following several recent repairs, and then went on to some of the woodwork on platform 2, where our supply of spectacularly rubbish Cuprinol Fence Paint was strengthened by the addition of used engine oil, thus providing a fence preservative almost as effective as creosote but not quite as smelly. Iris ready for its debut next week on a photo Charter.Thanks to everyone. Mike Evans. Following a brief dry start during which our gold steam experience guest arrived, we almost managed to get several productive tasks dealt with before the rain started thundering on the Mess Room roof. sound of the drill on the outside, where the Station Foreman contributed some cosmetic planking to cover the recently appeared vast hole, vast in the sense that it has been filled several times already and now we've decided just to cover it up. The class 31 travelled down the line to startle the residents of Duffield and the workshop area was mown ready for the weekend. A quick look at the Class 31 setting off for the south on a driver training day.